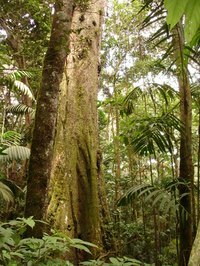 Rainforests are made up of several layers of vegetation, each representing a distinctly different habitat and requiring special adaptations by the plants that survive there. Some plants have special leaves to collect as much of the sun that filters through the canopy as possible; others climb trees to push their leaves toward the sun. Roots have adapted to support trees of enormous height or reach from the treetops to the ground. Trees 100 to 250 feet tall, like the kapok, stand above the all other trees in the forest and make up the emergent layer. The tree tops are in full sun and subjected to the full force of winds. Their leaves are usually small and adapted to retain moisture. Ordinary roots could not support trees of this height, so large buttresses up to 30 feet long brace the tree. Epiphytes, like orchids, attach to the branches of emergent trees where they can obtain sunlight. Their roots, called adventitious roots, enter the bark or rest on the bark to obtain nutrients and water where they collect. They are usually able to store water to survive periods of drought. Trees 60 to 100 feet tall make up the canopy layer of a rainforest. This layer is in full to partial sun and protected from winds by its density. Trees of the canopy are densely packed, forming a protected environment with full and partial sun. Lianas are a climbing vine up to 3,000 feet long that wrap around the trees of the canopy in an effort to reach the sun. They have sucker roots that allow them to attach to trees. The stems are woody and are so dense that they provide extra support for the shallow-rooted trees. Other plants, like the tree philodendron, start growing high in the treetops and send roots down to the ground. The roots can be over 90 feet long. Trees and other plants less than 50 feet tall make up the understory of the forest. This layer gets little sunlight and is very humid. Plants in this layer of the forest have leaves up to 8 feet long to collect as much of the filtered sunlight as possible. The leaves have some adaptation to shed water, usually glossy leaves that repel water. They shed water through pore-like structures called stomata. Sapling trees also inhabit the understory and are adapted to grow rapidly toward the sunlight. What is the Staghorn Adaptation?